I sent a note to my long-time friend and DocuSend CTO Fred Morgan the other day to wish him a happy wedding anniversary. He and his wonderful wife, Amy, have made over 35 trips around the sun together, so I decided to share with him a little insight from my wife’s treasure chest of wisdom: “A good marriage has one person who is always right, and another person who is the husband.” Not one to be outdone, Fred wrote back with: “If a husband speaks in the woods, and no one hears him, is he still wrong?” That got me thinking how futile the road to perfection is. It is paved with mistakes, and eliminating all of them is not possible. But controlling them is. Most of us know it as “managing our expectations,” and it’s really not all that hard. I was thinking about this as I was driving to work recently—that it is a fundamental principal that applies to many of the products and services offered in business. One of the services my own company offers is as good an example as any. 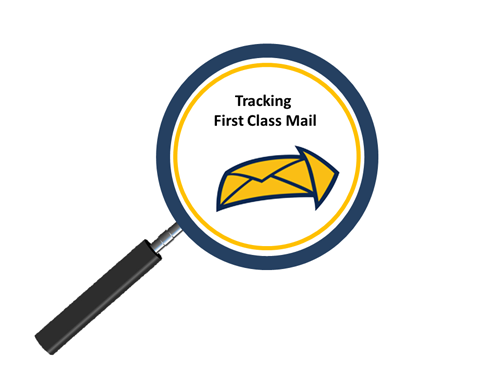 Tracking First-Class Mail is a premium service that can prove to be a great value to some of our users, but only under the right circumstances. In other words, it may not be worth the investment for all businesses. That’s why you won’t find it listed under any of DocuSend’s standard product lines. The service is called USPS IMb tracing, and simply put, it isn’t simple enough to use, and there is no simple explanation of why it’s not simple to get results from it. Before you start thinking I’ve become simple-minded, it will help if I define what the service does. And of course, I’ll try to keep the explanation simple. Ever notice those little series of short and tall vertical bars on the letters you receive in the mail? Those are barcodes, which can be either binary or alphanumeric, and they contain lots of information that the post office uses to deliver the mail faster and more efficiently. They are called intelligent mail barcodes (IMb) and contain data about the address, the type of mail piece, the class of mail, and even info that traces the path of the piece as it travels through the mail stream to its destination. It’s really an extraordinary technology the USPS launched in 2012. It can produce wonderful results for organizations that need to know if and when a mail piece has been delivered. Tracking mail is accomplished by imbedding unique tracking numbers into special barcodes and printing them on each mail piece. It is only available on “automated” mail pieces, and you can identify them by the 3-inch row of tall and short marks I referred to above. This little barcode contains lots of other information, but for the purpose of this article, we will focus exclusively on the tracking numbers. Mailing companies purchase the service through a licensed postal software provider certified by the USPS. So, it’s really the post office that makes this technology available through third-party vendors. There are two types of First-Class Mail the post office traces. Outbound mail, often defined as Destination IMb tracing, and inbound mail, defined as Origin IMb tracing. Destination IMb Tracing lets you track outgoing mail pieces such as invoices, late notices, statements, credit cards, statements, marketing mailers and other important communications sent to customers. Mailers receive scanned information that can indicate mail processing status, from point of entry to delivery. Origin IMb Tracing lets you track incoming reply mail pieces such as return payments, orders, and other responses from customers. Recipients receive notification that customers have placed their reply pieces in the mail stream and the post office is processing them for delivery. It goes back to managing expectations. Let’s say you hire a company to process and mail your invoices, and you pay the additional charge to track them. Once your invoices are prepared (printed, inserted, and postage applied), they will be delivered to a postal facility called an acceptance unit. The barcode will be scanned and the data will be loaded into a database, which starts the tracking process. As each mail piece travels toward its destination, the post office transfers it through additional postal processing facilities all over the country, called entry units. It’s similar to taking connecting flights when you travel by air. The post office may have to use several entry points before the piece arrives in the hands of a mail carrier for final delivery. But not every entry point is capable of scanning every piece of mail they process. Even those that are equipped may have to bypass the scanning process if the equipment malfunctions. The system is good, but not perfect. When the tracking is interrupted, the invoice you’re trying to track drops off the radar, and you won’t know why. It is estimated that this can happen to 10% of trackable mail. When this occurs, you may think your document was never mailed, so you send out another one right away. No big deal, right? Except you have to pay for it again. And if it happens often, like 10% of the time, that adds up. Not to mention how your customer may react if they receive two of the same invoice weeks before payment is due. It won’t make your business look very efficient. For me, even worse is having to charge my customers to track mail that has a delivery standard of one to three days (First-Class Mail). You can pay us to trace it for you, but I’d rather see you spend it on something that produces better results. You may be wondering if there are any good applications for destination tracing. The answer is a resounding yes. If you are sending mass marketing material for a special promotion or sale, chances are you will use standard mail instead of first class. And standard mail can take much longer to be delivered. Companies trace this type of mail to anticipate call volumes, staffing for sales, and call center management. It’s a great management tool for controlling promotional events. But tracking invoices that will be delivered in a couple of days anyway? Kind of like painting a new car you just drove off the lot. There is circumstantial value here as well. This can work well for businesses that want to know if their customers have put their check in the mail. The tracking codes are imbedded in the remit-to address, and if the code shows up in the tracking system, having to send reminders and cancelation notices can be avoided. Even so, I advise my clients to do a quick analysis of how many payments are received by mail before they pay for the tracking. That’s because even though many consumers prefer to receive invoices delivered to their homes, most pay them electronically or by phone. Why spend five bucks on a nickel problem? I encourage my users to find out how many of their clients pay by check before spending money on tracking their reply mail. So that’s how a great technology can have disappointing results if the application isn’t managed correctly. And that’s why we don’t prominently advertise it on the DocuSend cloud-based mailroom website. We don’t want to clutter it up. We only build tracking mail into our enterprise integration mailrooms after we are sure the user will get the results they are paying for and expecting. Thanks for taking the time to read this. Please help us help other small businesses grow and be healthy by sharing your ideas and innovations in the comments section.